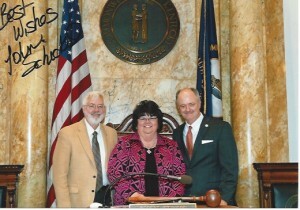 Pictured above from your left to right is Donald Swikert, MD, Chair of KMA Legislative Committee, Nancy Swikert, MD Co-Chair of KAFP Advocacy Committee and Senator John Schickel (R, Boone). Dr. Nancy Swikert was the lead spokesperson for KMA and KAFP in discussion with the ARNPs. Not present was Ron Waldridge, MD II, President 2013-2014, and Brent Wright, MD, MMM, Co-Chair of KAFP Advocacy Committee that were members of the interim work group on developing the legislative compromise. Special thanks to this work group for their many hours of work on this issue during the recession months of the 2013 Kentucky General Assembly.